More recently, several states have implemented ELE using enrollment processes that reached many fewer children than the ELE approaches described above for Louisiana and South Carolina. Iowa, Oregon, Maryland, and New Jersey each sent simplified health forms to families whose children received SNAP, participated in the National School Lunch Program, or potentially qualified for Medicaid or CHIP based on state income tax records. For children to receive ELE, families needed to complete these simplified forms by mail or phone. Many forms did not even ask about income. Typically, 5 percent or fewer of families who were sent such forms returned them. 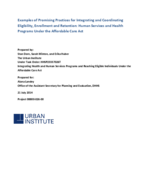 In the most successful ELE processes that required this step, just 13 percent of families returned the forms.85 More recent efforts at Medicaid targeted enrollment strategies have achieved much better results, as explained earlier, but the initial mailing response rates still averaged only 34 percent. Another study, aptly titled, “$100 Bills on the Sidewalk,” analyzed seven companies that offered employer matches to worker contributions into 401(k) accounts. Workers over 591⁄2 years of age could obtain employer payments without cost; because of their age, such employees’ contributions could be withdrawn, immediately, without penalty. Nevertheless, at each of the seven firms, between 20 and 60 percent of eligible workers failed to claim their employers’ maximum matching contribution, with losses that could range as high as 6 percent of annual income. At the median firm, 31 percent left employer contributions unclaimed, averaging 2 percent of annual income.